Deluxe Limited Edition ON SALE NOW! 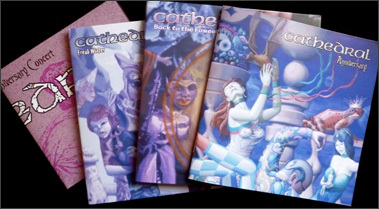 As announced earlier this year, 2011 will be the final year of underground UK metal mainstays Cathedral as a live band. Having recently reunited with former bassist Scott Carlson (Repulsion/Death Breath), they’ve just finished a busy schedule that took in Japan, America, Brazil, Greece, Czech Republic and Finland. The band is now preparing for their last EVER live appearance in the Northern Hemisphere at London’s The Forum in Kentish Town on Saturday 3rd December 2011. 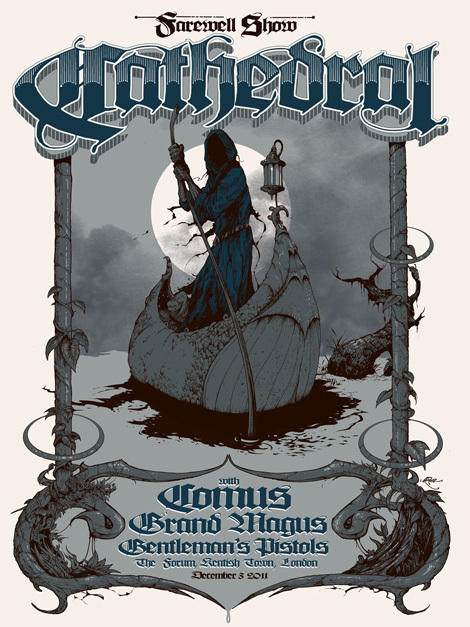 Sharing the bill will be very special guests and friends of the band; Grand Magus, Comus and Gentleman’s Pistols. Since forming in 1990 the band have released nine studio albums and several EP’s. A large part of their career was spent recording for Earache Records, debuting with the landmark 1991 Doom Metal classic Forest of Equilibrium. This was followed by the seminal 1993 Ethereal Mirror album, which was released by Columbia records in America to large critical acclaim. More recently Cathedral continued to expand on their overall sound, releasing two albums for the Nuclear Blast label. Dorrian continues; "Our latest album The Guessing Game is exactly where we wanted to be after all this time. Staying in one place, being repetitive and predictable is something we wanted to avoid right from the off." He adds; “When we first formed Cathedral, we were playing the most unfashionable form of metal that was around. You could almost say the same today, despite the fact that we sound quite a bit different now. With this in mind, it’s amazing that we managed to maintain our status, whilst many trends and bands have since come and gone”. Cathedral’s uncompromising individual style has gained them a large cult-following around the world. They recently reunited with the original line-up for their twentieth anniversary concert to perform the aforementioned Forest of Equilibrium debut in its entirety. This event was recorded, as well as a main set, containing a plethora of favourites spanning their illustrious career. The fruits of this recording have just been released as a deluxe CD box set through Rise Above Records and is simply titled Anniversary. Various limited items will be on sale exclusively at the show, including a limited edition 1,000 piece jigsaw puzzle, limited event screenprint, shirt and special edition of their forthcoming 12" EP titled A New Ice Age. The show editions will be white vinyl (100 copies) and transparent blue (200 copies) both come with Dave Patchett art poster, not available elsewhere.